In summer, the short hairstyles are more popular among women than ever before. They give women a fantastic and fresh look. Apart from that, they just need a little maintenance when compared with the longer hairstyles, and they are much easier to create a fashion look than any other hairdos. Some women may hold the view that short hairstyles may lessen the feminine charm of an exquisite woman. But, we have to tell you that there are many more ways to style the short haircuts, which are as gorgeous as the short hairstyles. In this post, your personal stylist is going to prove that the short hairstyles are quite stunning for all women and some of them may make you look several years younger and some may bring you an effortless chic look. Now, scroll down and have a look. Find the one you love and go for a fashionable short hair look. Enjoy! If you would like a chic look for your everyday look, then you should have a try with this blonde tousled short haircut. The pretty layers and messy style add life and movement to the final look and it’s a wonderful hairstyle whether for work or for party. For those women who are not ready to cut their hair short, this shoulder length bob haircut may be an ideal choice. The soft straight hair line makes women look tender and beautiful, while the light toned hair ends enable this simple hairstyle to be effortless chic. This asymmetrical haircut is so fabulous the the long side bangs. Nearly half of the face is covered by it, which leaves the whole look fashionable and mysterious. The red hair is quite beautiful for women at any age and the bright highlights add more youthful touch to the look. 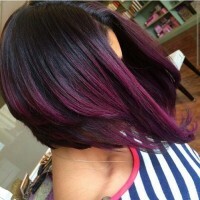 Don’t want to spend too much time styling your hair, then just cut it short and change it into a more trendy hair color. In this way, you can look cool all day long wherever you go. The moment you see this adorable short haircut, all your eyes have been captured. The cute layers and the pretty long bangs work well to create a perfect face silhouette. It’s an ideal hairstyle for women to get a firty and pretty look. Would you like to try? 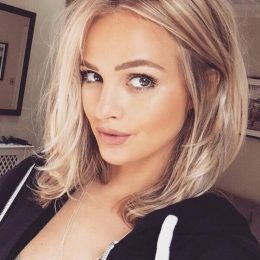 This simple blonde bob is trimmed shorter at the back the hair becomes longer in the front, which is styled to embrace the face so that your face will look much smaller. Besides, it’s quite a wonderful hairstyle for women with a round face or a square face. This is such an edgy haircut for those cool women. The jagged top and the shaved sides are both fancy for women to try. When you go for a prom or a party, this edgy hairstyle will turn you an absolute eye-catcher. 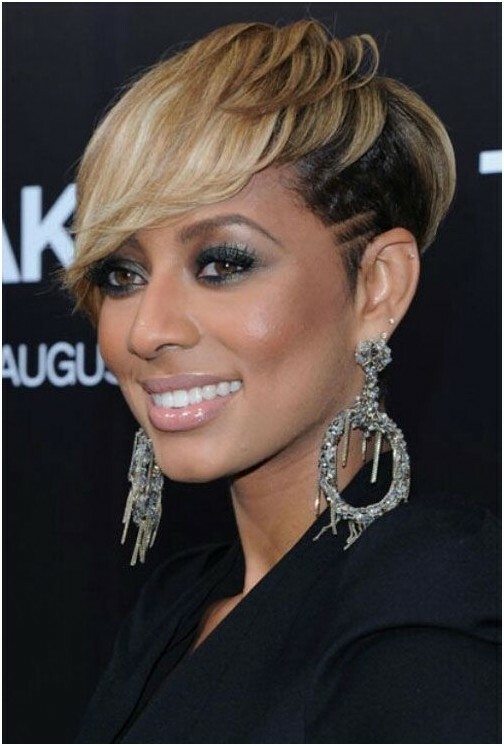 This short razored hairstyle is great for women with thick hair. 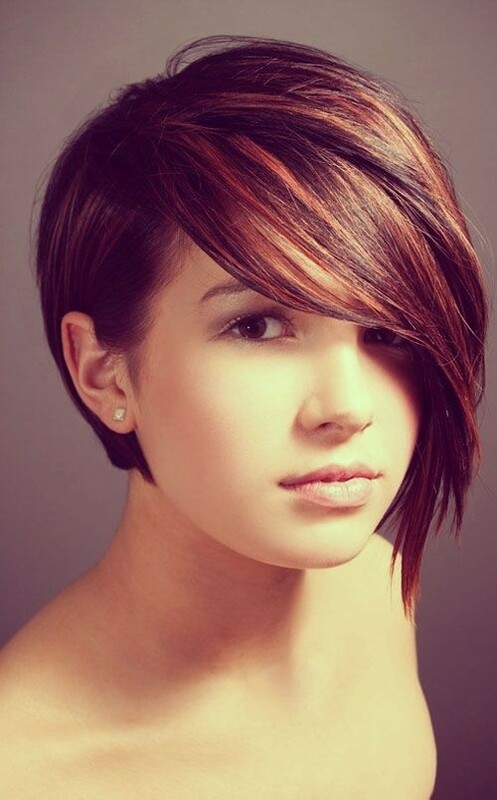 A lot of textured has been created with the thick hair and the boyish style is indeed cool for those chic women. Some one says that the dark hair makes women look younger. And I believe that it can also make your compexion look better. You may learn to add some fun to your ordinary hairstyle and create a side-swept long bangs with the front hair. Do you like it? As for the hair length, this is a real boyish haircut. However, you may find it so cute and pretty with the bright hair color and blended long layers on the top. It’s a nice short hairstyle for women to frame the forehead. When you decide to get a younger look, then you may try some light hair colors like what is shown to you in this picture. 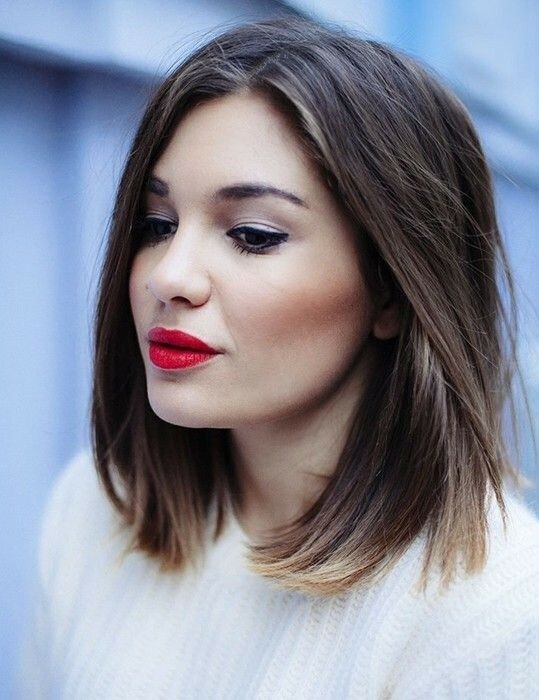 The deep side part make this straight bob effortless chic and the ash blonde hair color is what is hot now! If your locks are thick, you must be wonderful with this simple yet stunning haircut! Have you ever tried the spiked hairstyle? Okay! Not all women have the desire to experiment with such an edgy hairstyle, but if you are a rocker, you must be fond of this great short hairstyle. The long messy fringe make the original boyish short haircut different and fashionable. The wispy fringe in the front add some cute vibe to the final look. For all women over 23, this messy short hairstyle will be a nice option. 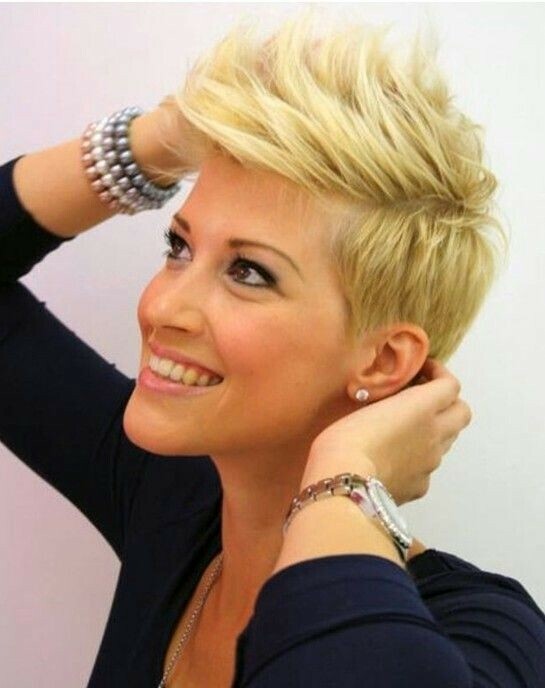 This blonde short haircut is quite simple and it’s a great hairstyle for women whose face is too short. It works well to elongate the jaw line and will make your face look longer and thinner. Some height has been created at the back and the fine long fringe is swept to one side, covering one eye. It’s great for some special occasions such as the prom or some holiday gatherings. If you wish your locks to be more sleek and glossy, then you should try this honey golden hair color. The bright hair color makes the hair look soft and lucid and your skin would also look radiant instantly. This short hairstyle is so cute with the rich layers and the side-parted bangs make it great for women with a forehead which is too broad or too narrow. Apart from the bob hair cut, the pixie hairstyle is also a beautiful hair look for women. 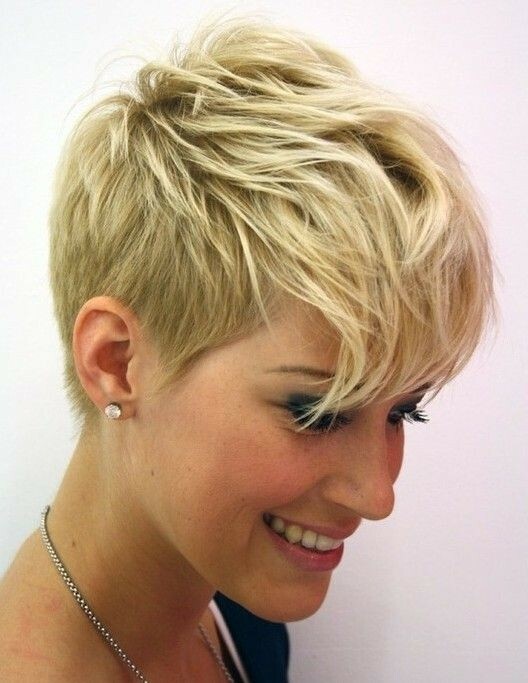 This blonde pixie haircut features a lot of texture and volume. The wispy fringe just embrace the face to create a smaller face silhouette. So gorgeous! While the blonde hair has been quite popular among young women, here is another chic hair color that deserves to try. That is the black hair color. The easy bob is faddish enough and you can get an even trendier look with a different hair tone. The messy hairstyles are quite trendy and popular during the recent years. When you style a long bob hairsytle with some messy effects, you will look so stunning wherever you go.